OUR MISSION To work in partnership with Hawai`i’s people to promote access to better health. OUR VISION Better health for the people of Hawai`i. Project Vision Hawai`i, in association with WE...a hui for health, is a non-profit organization that aims to achieve better access to healthcare for Hawai'i’s people. It provides health screenings and education with a focus on vision health. Project Vision’s Hie Hie Project Hawai'i is a mobile hygiene van that offers free showers to the people of the Hawai`i islands. Our mission is to protect every human’s innate sense of dignity: in the Hawaiian language, their 'Hie Hie’. This is why we bring free mobile showers to those experiencing homelessness to help humans retain their right to 'Hie Hie’ through hygiene. The organization’s mobile screening and shower units travel to communities statewide and serve as vehicles to better health. PVH provides vision screening for our children, seniors and those who are experiencing homelessness using state-of-the-art technology and is working with state agencies to create a statewide screening program. We are growing rapidly and need your help! 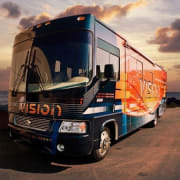 We would love to have assistance with with both Project Vision’s eye exam screening efforts as well as PVH’s Hie Hie project mobile shower unit! Would you recommend Project Vision Hawaii?